After a very well-received concert in 2015 for the Motueka Music Group featuring his stunning state-of-the-art touring organ, Kemp English will return to the Chanel Arts Centre on 10th December at 7:30pm with a completely different, but equally awe-inspiring programme, featuring primarily the inspirational music of Mons Leidvin Takle, but with a Bach/Vivaldi concerto thrown in for good measure. There are few contemporary composers represented on the world stage today who could possibly provide enough variety and interest in their music to sustain most of a concert programme. However, one such maestro is the quirky Norwegian Mons Leidvin Takle, whose amazingly approachable, jazz and blues influenced works are taking the world by storm. 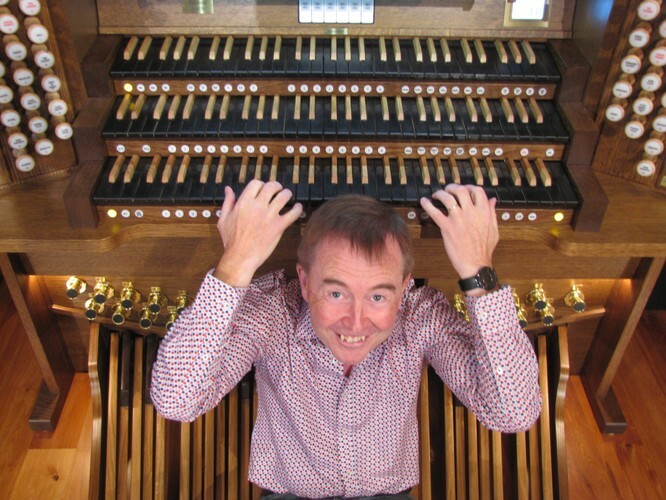 One of Takle’s biggest fans is New Zealand concert organist Kemp English who has recently become the first performer (apart from the composer himself) to record a CD devoted to these glorious organ works. Kemp is currently promoting the CD and the music with concerts worldwide. In July he presented a concert in Montpellier Cathedral in the South of France with the composer in attendance and received a standing ovation for his performances of Do not let your life be a time of waiting, A world full of possibilities, Heart of Peace and the other twelve works on the programme. A particular highlight was giving the world premiere of Emotions - a work Mons Leidvin Takle has dedicated to Kemp. As Kemp and the touring organ’s console will be centre stage at the Chanel Arts Centre, everyone will have a bird’s eye view of the performance. With the ability to sound like an English, French or German cathedral pipe organ, combined with a myriad of solo orchestral colours, join the mounting audiences up and down the country who are being blown away by this amazing instrument and performer. “Dr. English radiated enthusiasm. There was not a weak moment in the recital: every piece was played with impressive assurance and flair." Dr. Kemp English is one of the gems of the organ concert stage. Although based in New Zealand, he is much in demand as a solo organist, collaborative pianist, and specialist fortepiano exponent worldwide - relishing the opportunity to work in a diverse array of styles and periods. His solo CDs include the Stormin’ Norma trilogy on the magnificent Dunedin Town Hall organ, Schwammerl and Kemp English at the Fortepiano, in addition to several discs with violin duo partner Robin Wilson (Head of Violin at the Australian National Academy of Music) which appeared on the Decca label with Universal Music. English is an honours graduate of the prestigious Royal Academy of Music. In 2001 he was elected an Associate of the Royal Academy of Music (ARAM) in recognition of his distinguished performing career. He gained a PhD from the Elder Conservatorium of Music in 2014 and records for the Naxos label.